Rent a 14-seater (13+1), 17-seater (16+1), or 20-seater (19+1) minibus by JOYRIDE car hire, if you desire throughout Germany. For driving the minibuses you need an bus-licence - here you find a bus-licence example. category D (big bus-licence), we also offer you qualified and eloquent busdrivers of our driver-lease for the minibuses. 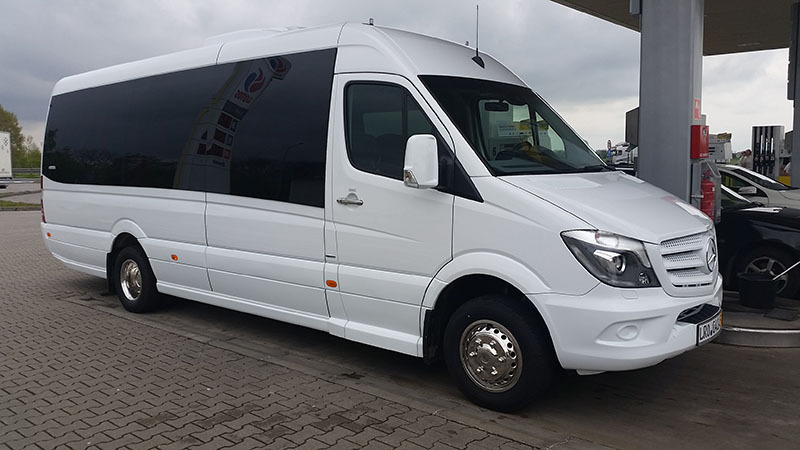 You can receive the minibuses also in the variants of a 10-seater bus, 11-seater bus, 12-seater bus, 13-seater bus, 14-seater bus, 15-seater bus, 16-seater bus ,17-seater bus, 18-seater bus, 19-seater bus + 1 driverseat, by reduction of seats for more luggage capacity. The Ford Transit in the variant of a 14-seat minibus is perfectly for shuttle traffic. The lateral sliding door and the double-wing-tail door enable an easy stepping in and stepping out. The vehicle is 6,00 m long and 2.30 m wide (incl. mirrors) and 2.50 m high. Everybody who carries regularly persons, appreciates a 14-seat minibus! The car-similar characteristics provide confident and precise handling. The Fiat Ducato has a high standard of comfort for all traveller. With its capacity of 13 - 16 seats plus driverseat and its interior, the Fiat Ducato gives consideration to every passenger. The vehicle is 6.40 m long, 2.40 m wide (incl. mirrors) and 2.70 m high. All seats have head-cushions, seat-belts and flexible arm-rests. Because of the moveable footboard, the moving in and out of the minibus is very easy. The Ford Transit minibus has 18 seats. The two-seater bench for the co-driver is for 2 people less comfortable, but all the other seats have an adjustable backrest. The Transit has a air conditioner in front and back, a microphone connector, a USB port and an internal 220 volt outlet. The external dimensions of the transit are 6.70 m long, 2.30 m wide (including mirrors) and 2.75 m height. With luggage capacity, the removal of the rear seats is recommended. An automatically extendable boarding aid for easier entering and exiting through the large side door. The VW Crafter minibus Hanover combines the superior equipment with leather seats, auxiliary heater, cruise control, navigation and a reversing camera with the reliability of a Volkswagen product. The car is 7.35 meters long, 2.40 meters wide (including mirrors) and 3.00 m high. The seats can be moved on the rail system. So you can variable adjust the luggage room or the intermediate spacings. An automatically-opening side door with an automatically extendable boarding aid makes it easy to enter and exit the minibus. The Mercedes Benz 516 Sprinter has a capacity of 19 seats plus driverseat plus codriverseat. With its interior and comfort the minibus will fullfil all passenger needs. The vehicle is 7,77 m long, 2.40 m wide (incl. mirrors) and 2,90 m high. An automatically opening door and two entry-handrailings ensure an easy entry. Flexible arm-rests, a 17-inch monitor and a CD- & DVD player provide comfortable driving and travelling experience.